Discover's "White Label" brand delivers its next instalment courtesy of Airborne US. Kraken is a driving tech trancer rinsed with acidic fills, stabs and a cool breakdown that moves from light to dark with effortless ease in the breakdown before kicking back in with a detuned lead that sits over a cool bottom end to give a dark but funky syncopated feel. Everything about Kraken cuts through with precision - just how we like it. 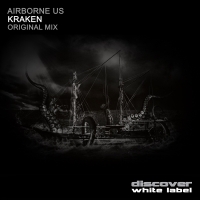 'Kraken' is available now from Beatport and iTunes.